Creating a sense of urgency can be extremely powerful in email marketing, and marketing in general. Urgent situations cause us to suspend deliberate thought and act on rash, snap impulse decisions. Urgency causes people to act quickly. Many times what is stopping a subscriber from converting on a landing page or email is people thinking too hard, not responding to our calls-to-action or simply waiting too long to act. Raising the urgency level in our emails cuts into this to create a significant improvement to conversion rates. In this post I’ll go through some of the methods you can use to create urgency and some examples of how companies are already doing it in their emails. Countdown timers are widely used across all industries. They’re the universal symbol for not only time, but time counting down. It reminds the subscriber that the clock is ticking, raising the urgency level and compelling readers to act before the time runs out. Here is a great example of an email from TigerDirect.com who included a prominent countdown timer as the central piece of their email. There’s something to be said for this technique. You’re empowering your user to act. By using terms like “Act now!” and “Hurry!” you’re pushing them towards making a quick decision. Although your regular subscriber’s inbox will be flooded with emails like these, they do work. Here’s an example of a Homebase hero image with a term just like this. Words and phrases similar to this force your subscriber to think quickly, improving the likelihood that they convert. One important thing to note with these terms is that excessive use could land you in hot water with spam filters. Avoid overuse of these words and phrases to steer clear of spam folders. You can also include these phrases directly into your imagery, as per some of the examples below. The scarcity principle is one of, if not the most, powerful ways you can create urgent behaviour. It runs on the idea that when a subscriber thinks something is running out, they desire the product more. Scarcity can be created in your email campaigns very easily. By creating a product or service with intentionally limited supply, or constantly reminding subscribers about the limited supply of an otherwise abundant product, you can force people into making rash decisions. Recently, Litmus used the scarcity principle to great effect in their email campaign. 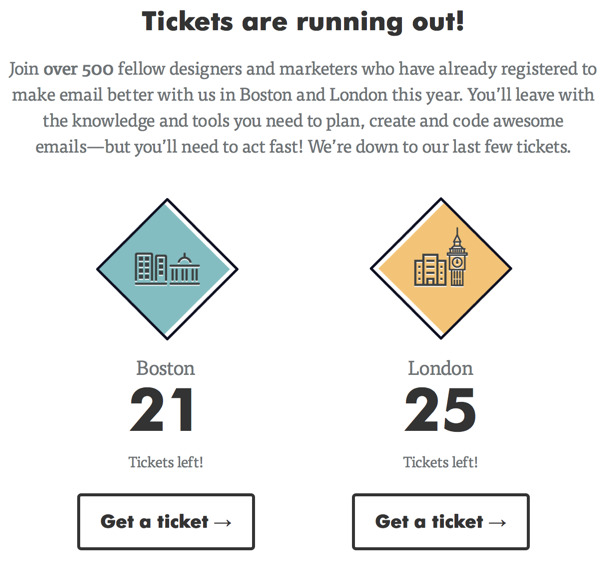 They let subscribers know the exact amount of tickets left for the Email Design Conference, encouraging users to buy the tickets before they all sold out. Let me ask you a question. You have two Italian restaurants side-by-side, one is full with a queue outside, the other has only a few people eating. Based on a snap decision which one would you presume is better, and which would you prefer to eat at? Most people will presume the full restaurant is better, and that’s due to psychological theory called Social Proof. It runs on the idea that if a product is low in stock or a service is busy humans will interpret that the product on offer must be good, since everyone wants it. This ties in somewhat with the scarcity principle. Lets look at some example-specific examples of social proof in action. The signup that appears on the Litmus website for their newsletter is a great example of this. Another example of social proof in action is in this Empire Direct email. Not only is it letting subscribers know that 213 people have already bought this product, it’s also telling them that 95% of buyers would recommend it. Once again, appealing to our quick decision making side. 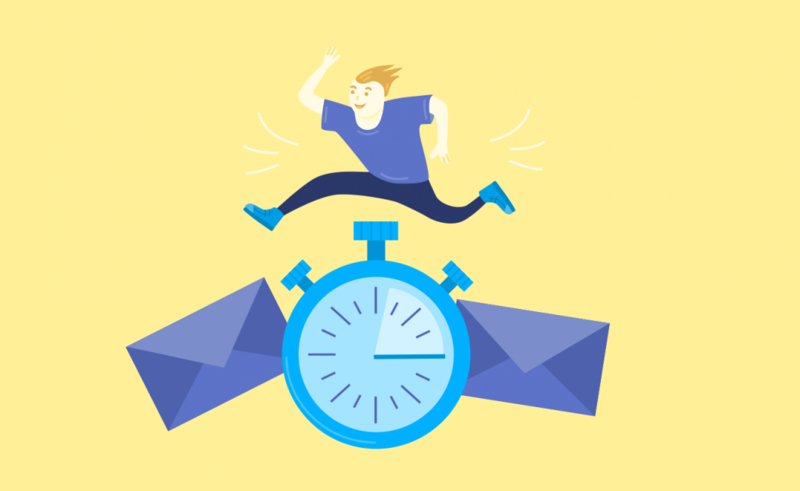 There are a lot more examples of companies using a sense of urgency in email marketing in effective ways, this is just the tip of the iceberg. I do have a few more for us to ponder though. 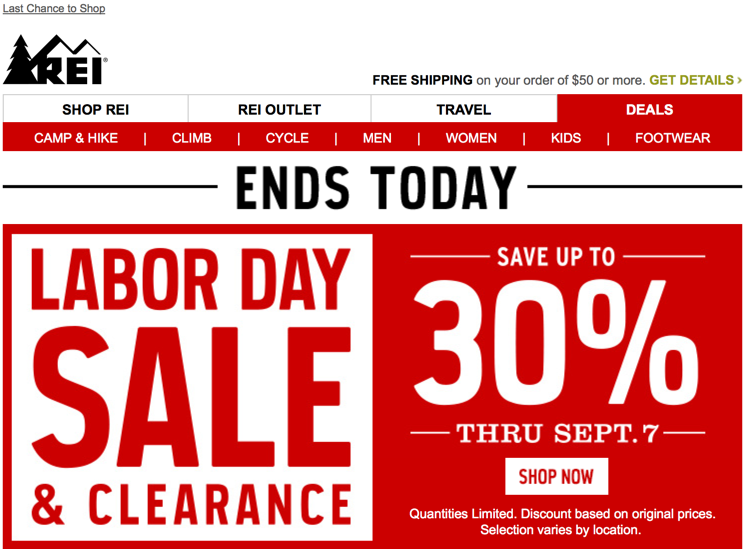 This email from REI features multiple calls to a sense of urgency in the subscriber. The first thing a user will see is the subject line and preheader, reminding them that it’s the last chance to shop and the sale ends today. That is followed up by the use of large text and bold colours to reinforce the ideas further down the email. Note the large “Ends today” text directly under the navigation. This Snow+Rock email is another great example. The hero images reminding us that the ‘Deal of the day’ ends at Midnight. It also features a great spinning animated GIF that drags our attention to the fact that there’s only one day remaining on this offer. 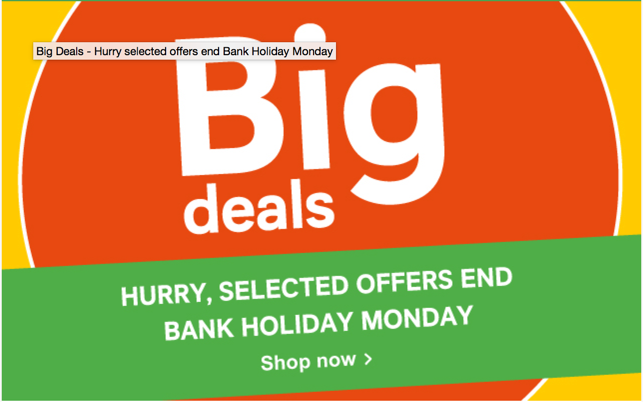 This House of Fraser sales email features some of the terms I mentioned earlier to force a sense of urgency. It also features a great animated GIF behind one of the terms “Must end today” to really draw your eye to it. Following on with the theme of emotive text and animated GIFs, this hero image in a recent TK Maxx email ticks both those boxes. It’s definitely a bold choice! You can find plenty more examples of emails like this to use as inspiration all throughout your inbox. Hopefully I’ve shown you in this post the power of using a sense of urgency in your email campaigns and how other companies are doing it. It really is a fantastic way to encourage users to act on your offers. A lot of the techniques featured in this blog include some similarites to the Nudge principle, which I found fascinating. If you want to read more on this, I’d encourage you to check out the Nudge Blog or buy the book on Amazon. If you’d like help implementing any of these techniques into your email marketing feel free to contact us.